The Holocaust Extortion Cult opens up new can of worms by its avowed ‘Nazi Survivors’! 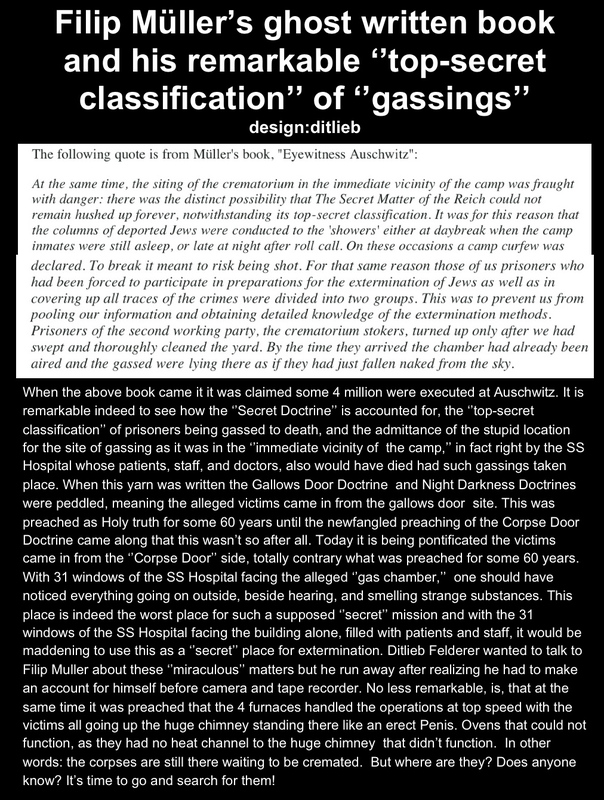 In the year of l982 a new Doctrine emerges from the Holocaust Extortion Cult forcing investigators to change their former belief of the Cult. Seemingly, for the first time, it appears, the Jewish Sonderkommando did not consist of Sicarii male killers, but women! Years ago, after we published Auschwitz Exit in which we exploded the HEC Cult. Then in 1982, the Exterminationists were caught in a new dilemma with the ‘Nazi Survivor Testimony’ of a woman calling into the Talk Show of WJW850 in Cleveland, Ohio, USA, with Zionist host Merle Pollis. Now for the first time, or at least, what seems to be the first recorded time, we learn that women served as the real Jewish Sonderkommando. Prior to this it was always the male. One promiment such was the Genocide Sicarrii Serial Killer Filip Muller who, using his own argument, was responsible for the killing of Six Million Jews, most of them inside Stalin’s Holy Shrine at Auschwitz. Hence, here we see the bluff of the HEC Cult members who claim to cherish their ‘survivors’ as the purest of Martyrs. The facts are, the Cult dreads to present them. And now even more with modern recording technique. And so their presence have greatly diminished, mostly not due to old age, but for the embarrassment to have them on record dishing out yet another impossible Doctrine, making the former ones into arrant nonsense. Listen now attentively how the caller to WJW850 Talk Show host, Merle Pollis, describes her true vision while supposedly either at Buchenwald or Auschwitz. Here for the first time we learn, in 1982, that the Jewish Sonderkommando consisted of women who administrated the mass murder operation. Jewish Sonderkommando consisted of women! I was smelling for four weeks and watching th…them burning and my girlfriend was taking them there and putting them in…in holes [halls?] and they were putting paint over them, white stuff, and burning them. Next Next post: Did the Genocide Ethnic Cleansing Sicarii Serial Killing Jewish Sonderkommando consist of men or women? ditliebradio The Holocaust Extortion Cult opens up new can of worms by its avowed ‘Nazi Survivors’!